U.S. 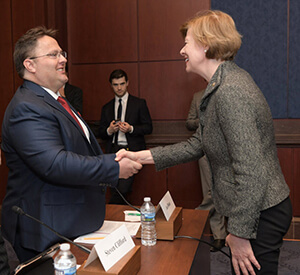 Senator Tammy Baldwin (right) hosted a hearing on Tuesday to highlight the effects of these harmful corporate stock buybacks. At the hearing, CWA Local 4621 President Joe Olson (left) told Senators how AT&T has been laying off thousands of workers and keeping wages stagnant while pumping money into stock buybacks. U.S. Senator Tammy Baldwin (D-Wis.) hosted a hearing on Tuesday to highlight the effects of these harmful corporate stock buybacks. At the hearing, CWA Local 4621 President Joe Olson of Appleton, Wis., told Senators how AT&T has been laying off thousands of workers and keeping wages stagnant while pumping money into stock buybacks. "This Thursday, AT&T will be closing its call center in Appleton, putting over 20 of my colleagues out of work," Olson said. "This call center has been shrinking for years now, as there were almost 400 workers at the call center just a decade ago. You can imagine what the loss of 400 good jobs has done to a pretty small community like Appleton." Olson pointed out to the Senators that last year, AT&T conducted $609 million in stock buybacks, which alone could have funded 6,625 jobs. Meanwhile, AT&T has cut more than 12,000 jobs across the country over the last year. "For too long, corporate executives like those at AT&T have decided to prioritize making their short-term share price as high as possible instead of helping the workers who are the backbone of the company. I urge Congress to stop these malicious stock buybacks and help create jobs to benefit communities like mine," Olson said. CWA members are supporting Sen. Baldwin's bill, the Reward Work Act, to rein in corporate stock buybacks and empower workers to have a say in how their company's profits are spent.